by Rob - September 24th, 2016. Two years ago today — September 24, 2014 — I started experimenting with vDos, a DOS emulator for serious business applications under Windows developed by Jos Schaars in the Netherlands. 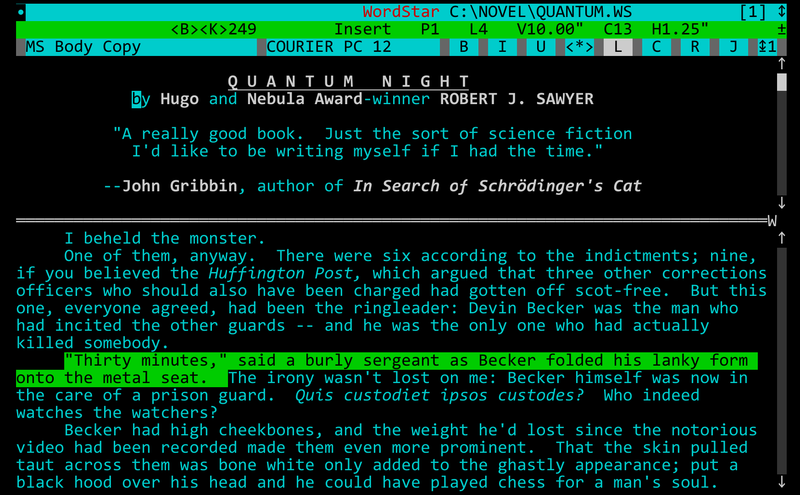 There’s been a wonderful side project for some time, now called vDosPlus, developed by Wengier Wu of the University of Toronto that adds lots of additional support for word-processing users; Wengier has worked closely with power users of WordStar (me! ), WordPerfect (Edward Mendelson), and the whole XyWrite mailing-list community to give us a wonderful, stable platform for running our old workhorse software under Windows XP through 10, both 32-bit and 64-bit. Up to today, I’ve run WordStar mostly under TameDOS, not vDos (or vDosPlus), and exclusively on 32-bit machines; my interest in vDos and vDosPlus was in future-proofing my key writing tool, WordStar. But today, on the second anniversary of me becoming involved in the vDos community, I now actually have a production system that uses vDosPlus exclusively: my first Windows 10 computer, and my first 64-bit computer: a Dell Inspiron 11 3162 ultrabook. I just finished my first writing assignment on the new computer, and everything went flawlessly. Many thanks to Jos and Wengier! 5 Responses to vDosPlus: 21st Century DOS! It seems like an awful lot of trouble. Have you ever considered Vi or Emacs? It seems to me that either one should be able to completely emulate WordStar (and a quick Google says they at least have WordStar key bindings available).Both even exist in Windows versions. I must say, I’ve never actually thought of moving my ctrl key, even though I always disable the Caps Lock altogether and on Linux I use the right-ctrl as a unicode compose-key. Of course, if you did move to either Vi or Emacs, you’d still have people thinking you’re nuts, because the users of either one think you’d have to be crazy to use the other. Derek, it’s not just about the user interface. Vi and Emacs are excellent text editors, but neither is a substitute for a full-fledged wordprocessor. And blithely suggesting someone change file formats is to vastly underestimate how much trouble THAT is. I’m not dismissing it, honest. And I’m also not “blithely” suggesting changing the file format. My recollection (_I_ haven’t used WordStar in at least 20 years) is that the file format is fairly simple – simple enough that I’d be surprised if somebody hadn’t already done the work to process the files with Vi or Emacs. Either program is as complex as you want it to be. The format was simple through WordStar 3.3; it got more complex starting with WordStar 4.0, which added extended-character support, and even more complex and versatile starting with WordStar 5.0 (and continuing through WordStar 5.5 and 6.0), which introduced symmetrical sequences for coding fonts, colors, footnotes, and (starting with 5.5), embedded style-sheet libraries. If one really wanted to use an alternative program with a WordStar user interface a much better choice than Emacs or Vi — which, again, are text editors, not word processors — would be to use Mike Petrie’s WordStar Add-In for Word, since .doc or .docx are what most publishers want.